Mega Man Universe will let you create the side scroller you dreamed about back in grade school. Ages ago, I used to spend my school days ignoring my teachers and drawing my own Mega Man maps on graph paper. I'm sure that I wasn't alone in this - what gamer wasn't left inspired by the insanity of NES side scrollers? Heck, even if you never created your own sprawling labyrinths, you surely must have at least wondered what would happen if Final Fight's Mike Haggar was dropped in a Ghosts 'n Goblins level! Well, it seems out that the upcoming Mega Man Universe will finally give fans a chance to fulfill these childhood design fantasies. Earlier videos slipped in characters from other Capcom games, like Street Fighter's Ryu, leading some to speculate that Universe would be a crossover title. 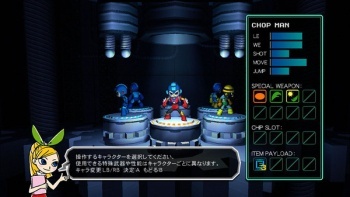 These were actually subtle hints at the character customization mode, which allows players to create their own "Mega Man" out of a massive array of premade parts. These parts won't just alter your appearence. According to Capcom, your character's innate abilities will also shift according to what pieces you built it out of. While that statement was left purposefully vague, I'm going to go ahead and take that to mean that I can stick the grappling hook from Bionic Commando on one arm while rocking a huge cannon on the other. No, I don't need fingers - this is a platformer, after all. Mega Man Universe will also allow players to construct their own stages, dropping in platforms, enemies, and power-ups at will. The developer has hinted that, like with the Ryu example in the character customizer, the level designer will come packed with parts inspired by other Capcom classics. Perhaps you will even be able to create a character that looks a little like one of the developers and drop them in a room full of spikes for a bit of long-needed catharsis. Like in LittleBigPlanet, players can share their custom levels with other gamers around the world. While we do know that Universe is coming out for both the PS3 and 360, there has been no word yet on whether levels created on one platform can be downloaded on the other. Regardless, I can't wait to see what the fan community can come up with, or more likely - how many slight variations of Mega Man 2 levels I can slog through before I scream. Given how much my platformer skills have atrophied, can I at least request a few spike-free stages?